Footsteps echoing across an open hall, or crunching gravel on the drive. Horses nibbling grass. Dogs barking. Does hearing these sounds while visiting Hylands House and Park make it easier to imagine the lives of its former residents? Do these enduring noises help us understand the site’s journey from domestic house, to hospital, to tourist attraction? For most of the site’s history, only natural sounds would have been audible: wind blowing through the trees, birds singing, animals running across the estate. Periodic references to the ‘Highlands’ property on the outskirts of Chelmsford can be found in documents dating back to the mediaeval period, but the history of the site is better documented from 1726, when Sir John Comyns purchased the site. 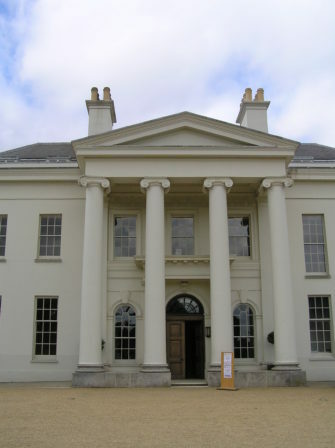 By 1730, Hylands House had been built as a grand country retreat for this upwardly mobile MP and lawyer. From then, human sounds would have increasingly encroached on the natural. We wanted to see what Hylands sounds like today, to think about continuities and changes in the sound of human occupation over the years. Setting the scene, we recorded the sounds of the Park through an open window on the front of the house. You can hear the exuberant enthusiasm of children coming and going: is this similar to when Arthur Pryor lived in Hylands with his eight children? Or were children more restrained in the late nineteenth century? The recording made at the top of the Grand Staircase demonstrates how sound from the ground floor travels up to the top. However, carpet on the steps mute the footsteps of people walking up and down. Were the steps carpeted when the House was in occupation, or did you hear more tapping of heels on marble floors? In the Study downstairs, again sound from outside filtered in through an open window. A car driving away from the House gives a contrast to the trot of horse and carriage that must once have filled the air. However, the progressive Gooch family, in residence at the start of the twentieth century, were the first to have cars, so it is not such a new sound. The Banqueting Hall must once have been a hubbub of conversation and clinking cutlery. Today, it is a hushed environment where painters are painstakingly restoring the décor. The music you can hear in the background is from a children’s Inflatable Festival that was taking place at the back of the House. Just at the end, you hear a pop as a painter opens a new tin of paint. We were puzzled by the faint scratching sound we could hear in the wine cellar in the basement, until we realised it was a sound effect that we guessed we had triggered by walking into the room. We left the microphone in the room and tried to set it off again, with a little success. It was only when some other visitors were walking around that we discovered there was additional interpretation that sometimes played. I was amused by the very English accent of the Dutch merchant Cornelius Hendrikson Kortright, who owned the house from 1797 to 1814. There are some nice sounds of movement overhead, but it is a much quieter environment than it must have been when it was the kitchen for a busy household. The carpet had prevented us capturing some nice, echoing footsteps on marble on the Grand Staircase, but in the West Wing there is a wooden staircase put in by Arthur Pryor. During the renovations after the House was purchased by Chelmsford Borough Council in 1966, this staircase was removed and thankfully safely stored until it could be returned. Refusing to give up on the quest to capture the sound of heel on marble, we recorded in the entrance hall, which still has a hard floor. Unfortunately most people were wearing more casual footwear, trainers or sandals, that did not make as much noise – though there is that distinctive trainer squeak at one point. Even where building features remain, then, cultural changes can alter daily soundscapes. 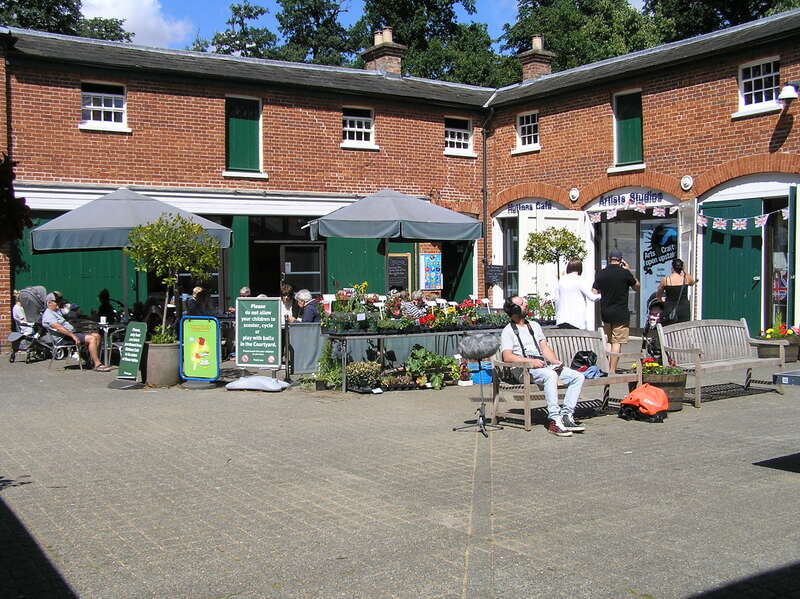 The neighing of horses in the stable courtyard has been replaced with a cacophony of conversation from tables outside the café and the bouncing of ping pong balls – a different sound to the smack of balls that would have been heard in the Billiards Room that survived through several occupants. Another continuity came from the clock tower chiming on the top of the stable block, which you can hear near the end of the recording. We recorded in the midst of the Inflatables Festival. 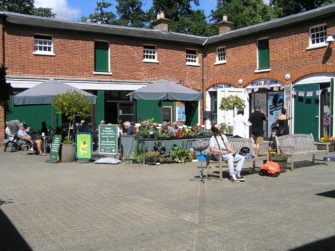 While events such as this and the music V Festival are relatively recent, Hylands Park has been the site of public fairs since at least the 1920s. When Mrs Hanbury owned the site, she hosted Essex Country Shows, Red Cross rallies, and other fetes. Admittedly the sound of these was probably quieter. What will Hylands sound like in another 300 years?